MS® hydrophobic PVDF membrane is treated with a validated process which has the super hydrophobic characteristics. It can be used in the field of solvent solutions, air/gas filtration, sample preparation of HPLC and GC, having wide applications and excellent heat and oxidation resistance. 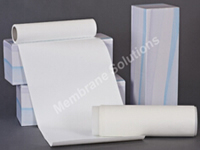 MS® hydrophobic PVDF membrane has a series of excellent performance, especially the super hydrophobic and high flow rate. Note: Customized widths are available upon request.